Body 2 door coupe with optional body kit consisting of Irmscher front wings with wheel arch extensions, side skirts, rear wings, a three-piece rear spoiler and twin headlamps* (*but only for the Manta B, 1982 - 1984) all in ABS plastic 2 door coupe with integral roll cage and sump guard. Kevlar bonnet, boot lid, front wings, doors and all spoilers. The Manta 400 was the most significantly different model available during the eighties. It was built around the general Manta bodyshell but several modifications were made to improve roadholding . Giving a total of 245 road cars for all of Europe. Many people incorrectly believe that the Manta 400 is a mass of huge wheel arches, rear spoilers, etc. 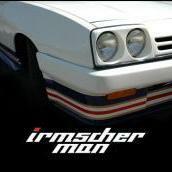 The bodykit was actually an option which, if required, was fitted by Irmscher. Otherwise it looked the same as a GT/E coupe or even a pre face-lift Manta B coupe. 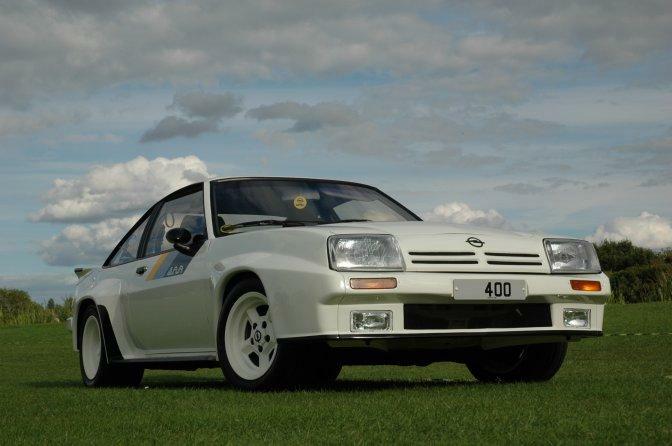 The car was available in any colour as long as it was white or silver.The Manta 400 Interior, in Road trim, followed on with the traditional Irmscher theme using Recaro seats with the same black 'Opel Sport' cloth as featured in the other models. The standard coupe bodystyle was changed significantly with the addition of integral flared arches and extended front spoiler. Larger wheels were fitted to fill out the wheel arches. Some road models were produced without the wheel arch extensions, which made the initial outline very similar to a standard GT/E. Only at the traffic lights did the differences become apprarent ! It was in the Rally stages that the Manta 400 was perhaps at its best. Some of the worlds best known drivers during the eighties, sat behind the wheel of a 400. The rivalry between Jimmy McRae and Russel Brookes kept many enthusiasts enthralled for several seasons. McRae driving the AC Delco and Brookes the Andrews Heat for Hire 400. The Manta 400 made its competition debut in 1983, at the Tour of Corsica Rally. It should be blatently apparent if you ever come across a Manta 400, although they are extremely rare nowadays. The twin cam engine and the independant rear suspension should be proof enough of an original. 2410cc Fuel Injected engine (Road). 2410cc Twin Carb engine (Rally). DPP 117Y is the only right hand drive Manta 400's and it is still currently in existence. It was originally proposed that the 400 was made available in the UK in right hand drive form with a total of 25 for the 1982 model year. Unfortunately, this was not agreed, as Opel would only build left-hand drive cars. DPP 117Y became the Vauxhall / Opel marketing display car. It was built primarily for UK type approval, which was attained in January 1983. It was first seen by the public at the 1983 Motor Show. After that, the car was used by GM Motorsport as a "rally replica", and was the AC Delco 400 of Jimmy McRae and the 400 of Andrew Wood. When the 400s finished rallying in 1987, it was put into store at the GM Sport workshops in Northampton. There it remained until being saved by the Vauxhall dealer, Thorlby Motors, in Lincs. Fully restored back to all its glory, it is now in the safe hands of Tom. It is based on a Manta B 400 with the 2.4 16v engine. Compared with the Ascona 400, it has an "overdrive" indirect fifth gear, which gives greater top speed. The car is finished in Polar White with the door stripes. A full Irmscher bodykit is fitted, including the rear spoiler. Wheels are 8Jx15 Ronal at the front with 10Jx15 at the rear. The car has a spotless Opel Blitz interior and has been restored to a beautiful condition. It has been to several of the club national shows and always attracts a lot of interest. It was back in 1981 when the futuristic Manta 400 was first seen in the UK driven by Tony Fall. At this time he was watching Jimmy McRae in his Ascona 400 and Fall was confident he would have the Manta in competition in a few months. It took until May 1st, 1983 before FISA gave the official stamp, no. B237 and the new car made its world debut in Corsica in May 1983. McRae finished 6th on the Welsh in the first UK outing. Unlike the Ascona 400, the Manta makes full use of Kevlar body panels: the front panel, front wings, bonnet, doors, rear arches, boot lid and spoiler are all made from it. This saves over 80kg and makes the car more competitive than the Ascona. The engine is a Cosworth product and, unlike its 144bhp baby brother, produces 275bhp in phase 3 form. This is done with a pair of 50 DCOE Weber carburettors (rather than the 48's on the phase 2 engine) with wilder cams. All the really worthwhile power comes in at 5,000rpm and 275bhp arrives at the 7,200rpm mark. 0-60 is in under 5 seconds; top speed is dependent on gearing. A one-off four-wheel drive 400 was built and is now owned by a member of the Group B Club. How many of the former works cars still survive is unknown, although Ireland is known to have quite a few still being rallied. The last works built 400 is at the Griffin Trust in Ellesmere Port and is D902 RGS used by Andrew Wood. The rally history of the 400 has been well documented many times, and I am sure many readers will remember the AC Delco and Andrews Heat For Hire 400s. Cosworth, four cylinder in-line, 95mm bore, 85mm stroke giving a capacity of 2410cc. Steel crankshaft, light alloy head with twin overhead camshafts and 16 valves. Mobil 1 dry sumped lubrication and twin oil coolers. Twin 50 DCOE Weber carburettors, and a four into one exhaust manifold. Bosch electronic ignition. Twin plate clutch, Getrag 5 speed gearbox, direct top, driving a heavy duty rear axle with ZF limited slip differential. Final drive ratios were available in 3.18:1 through to 5.17:1 depending on application. Wishbones and coil springs with an anti-roll bar at the front. Five link rear axle with coil springs. Bilstein gas filled shock absorbers. Dual circuit AP callipers with vented discs. Front disc diameter 290mm, rear 278mm. Hydraulically operated with a cable handbrake. Manta 400 2 door coupe with integral roll cage and sump guard. Kevlar bonnet, boot lid, front wings, doors and all spoilers. Recaro seats, Sabell seat belts. High ratio rack and pinion, 2.7 turns lock to lock. Opel 15" alloy wheels, 5 stud fixing with 5" to 8" wide rims. Michelin TRX 135-250TR290 radial competition tyres to suit requirements.